Segmentation allows you to organize your results based on certain population attributes, such as region, department, tenure, etc. By uploading lists of participants, you'll be able to segment out different populations in order to get a deeper look into the results of your POPin. Enable segmentation by clicking on the "Customize" button, located at the top of your report. Scroll to find the "Segmentation" box and toggle the switch to turn it on. 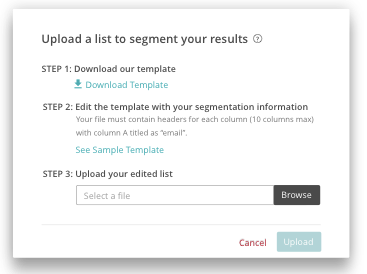 When segmenting your results, you'll be prompted to choose a list to segment. Once segmentation has been turned on and you've uploaded a list, you will be able to make changes using the edit button on the segmentation bar. If your POPin session has no activity at the time you would like to segment, you will be prompted to upload a new segmentation list, use an existing list (if one exists) or download an existing list. If your POPin session has activity, you will no longer be able to edit your segmentation list. You will be able to upload a new list for segmentation but will not be able to edit it again, so make sure it is correct. Upload a list containing your participants' email addresses and up to 9 attributes. There will be instances where POPin will blur the resulting data if our analytics engine detects the data is not sufficient to guarantee anonymity. These populations will fall into a "Multiple" ranking, which may combine multiple segments. NOTE: segmentation is not available for "Unrestricted" POPins. This POPin permission permits unverified users to view and contribute to a POPin and since unverified users cannot be tracked, they can't be segmented. If you see the above error message, try changing your security settings to "Restricted" or "Private".